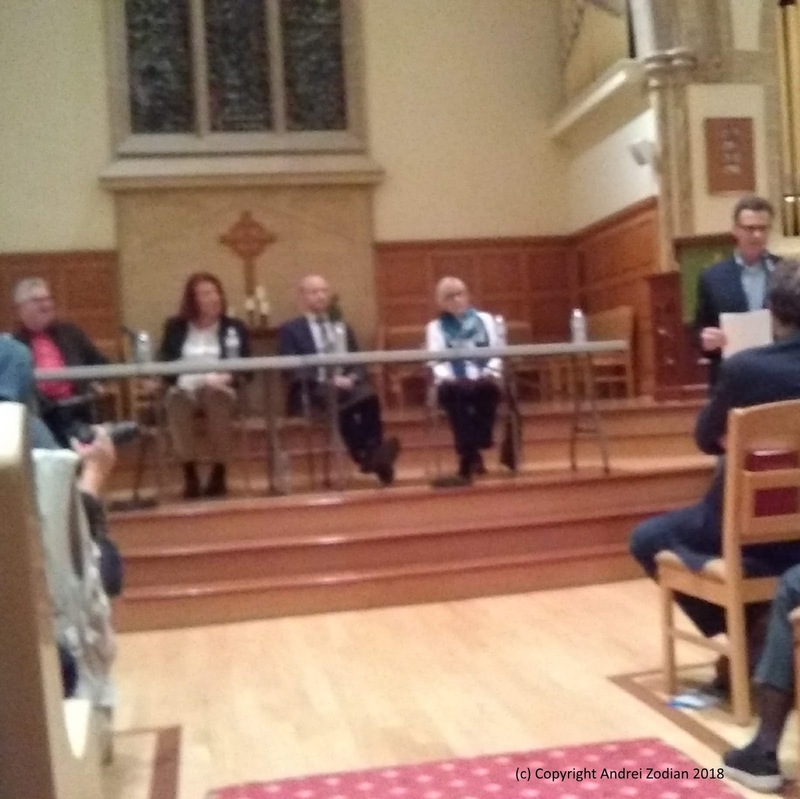 This was a "private" debate, organized by four neighbourhood associations, taking place in the same church where I worked at the polls for the first electronic provincial election here in Ontario. There were only four candidates invited at the debate, even though there’s more people running. Interestingly, the following candidates (listed from left to right in the photo and videos) are also the only ones profiled in the news media linked below (Toronto Star and Varsity). I asked each one by email their thoughts on direct democracy, after having provided mine (andrei.zodian.net/dd) and I display their answers as well. Marc was a man of few English words, but, according to his website, he has far more French words :). He came across as generally more conservative than the incumbent but less so than Nicki Ward, and quite pragmatic. Nicki was the most conservative and people seemed to respond to this kind of answers. When asked about injection sites, this was the only candidate to be clearly against. Got your note and your voice mail... I did try calling back, but stuck in "voice jail"
The short answer is that I am in favour of hyperlocal representation and the least possible barriers to government possible. I've read your work and as you correctly point out... Some hybrid systems RD vs. DD provide a balance of accountability and protect against destructive populism. Destructive populism which feeds to the lowest common denominator is something that is difficult to defend against. And we've seen horrific examples of this in action. There is another challenge in that minority rights are (by definition) not majority issues. I don't have "perfect" answers to this, but my own approach is to seek broad consultation and when given clear counsel... to actually take it. Mike seemed stressed out and defended his record with difficulty. He honestly admitted to having placed an injection site next to a Catholic school, without much of an explanation other than “staff studies”. However, another answer he gave to another question (which he supposedly could not comment on due to confidentiality) questioned the impartiality of staff advice and studies. We elect representatives to ensure our general interests are being kept top of mind in City Council. Councillors (the majority of us anyway) spend our time educating and learning about the issues so we do not make surface level, uninformed decisions about City policies or the future of specific projects. I do believe in greater involvement at the local level and believe we will need to restructure our governance model to better reflect our emerging neighbourhoods and to address issues that may be created as a result of Doug Ford's meddling. I am just unsure if the form of direct democracy you are suggesting would be the best option from a policy-making perspective. Best of luck on the campaign trail. My reply: (..)Whenever you have the time, even after the election (though I would prefer earlier), please tell me what do yo see wrong with returning power back to the people by starting to pose some council proposals (e.g., 10% in the first year) directly to voters, through the use of technology. I am sorry, but there is too little time before the election. Your representation of returning power to the people through your form of democracy is your opinion which I wholly respect and would be happy to chat with you about, but this will need to be after the election period. Sorry. Joyce seemed keen to provide full, thorough answers, but not always prepared and occasionally some answers seemed to lack substance. Nonetheless, she took thorough notes and it seemed that she would have preferred more time to prepare her answers. I have also met George Sawision on my way out, who had not been invited and provided me with his card. In terms of campaign literature, Nicki Ward stood out by having a business card with her photo and website, whereas everybody else had larger (and possibly more expensive) postcards or pamphlets. Of all the trustee candidates (whom I emailed and called, wherever possible), only two replied. Here are their answers, in chronological order of replies. Ted Crysler: I support ward councils on the TDSB level. This would be organised so that parents and students and other interested community members would be able to engage directly in the issues presented to the TDSB. Since the school boards are a little different from Council, we have less power to change it, but this is a form of citizen involvement that i think is very helpful and needed. On the Council representation issue, i favour community councils that involve large numbers of citizens representing the concerns of the local residents and making decisions on a local level on a lot of aspects of city life e.g. the use of section 37 money. This should not be left to the Councillor. These community councils would be effective and have the power to do things on a community level. There could be a place for direct democracy as you envision it on certain issues as well, though this would be a sea change from what citizens are accustomed to. Arnella Renda: Thank you for your question. Andrei i believe you're right about the power issues affecting our society as a whole and that the people should have a voice in the choice but this is why they elected you. You're the voice for them. It would slow the process of getting things done in city hall that need anseers yesterday and you're still taking votes. So im not for it because your voice should be loud enough. This is the reason you're voted in to speak on their behalf. We want to speed the process not delay it. You're the constitutes voice. You need to be powerful in your arguement from your people. I hope this helped. Have a super day. Good luck in the elections. Excellent answers, and though I’m not going to say who I’d vote for, criticism of my ideas makes me happy and goes much father, in my eyes, than “ghosting” (i.e., completely ignoring) my question. It is quite obvious that because of the media boycott of the other candidates, they (the ones left out of the Councillor candidates debate) have zero chances. I find it very hard to believe that the other candidates could have possibly performed worse than Ms Rowland and including candidates in the debate or mass-media solely because of their lineage (Ms Rowland’s mom was a well-known politician) is a perversion of democracy and of the “5th estate” / associations’ roles. Then again, at least Ms Rowland, Mr Layton and Mr Cressy (and possibly more incumbents) have this (dynasties) in common. Meanwhile, my KnowYourVote profile was published (5 days after submission), and sadly, there were errors. It took a few days of emails, but it was finally corrected on October 5. Apologies for this. I've updated all links to the below. Once my info was corrected, I tried to contribute in improving this TPL effort. 1. candidates should be presented in a random order on each page (re)load. Candidates with a surname starting with Z, such as mine, are perpetually last and that could create an advantage for those at the top of the list, as many people may simply tire to click names and find no answers. 2. the names of people who did not respond should be smaller, to give the user a visual clue and avoid "empty clicking". Finally, my info seems alright on the City official website, on VoteCompass as well as KnowYourVote. I’ve also discovered two new pages dedicated to the Toronto 2018 election, linked below.